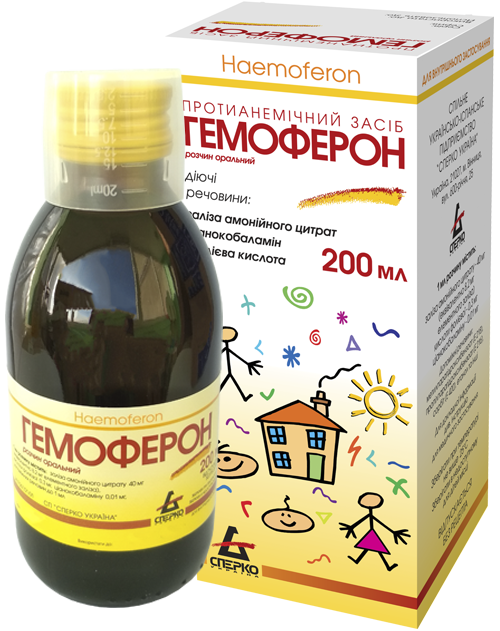 Haemoferon – is OTC drug, well-balanced combination of ferrous iron, vitamin B12, folic acid in a solution for effective treatment of iron deficiency and folic acid deficiency anemia and conditions associated with increased demand for iron and other drug components in adults and children 6 months of age and older, including pregnant women1. 1 ml of solution contains ferric ammonium citrate 40 mg (corresponding to 8,2 mg of elemental iron), folic acid 0,3 mg, cyanocobalamin 0,01 mg and other excipients. Treatment of iron deficiency and folic acid deficiency anemia of different etiology; conditions associated with increased demand for iron and other drug components (pregnancy, lactation, the period of intensive growth and puberty, acute and chronic haemorrhage, burn disease, abdominal surgery post-operative status, celiac disease, rapid weight loss). Haemoferon is a well-balanced combination of ferrous iron, vitamin B12 and folic acid, required for effective haematopoiesis in the bone marrow. Iron is a component of haemoglobin, myoglobin and various enzymes. It is responsible for the reversible binding of oxygen and supply of oxygen to the tissues; participates in oxidation-reduction reactions and stimulates erythropoiesis. Folic acid together with cyanocobalamin stimulates erythropoiesis, is involved in the synthesis of amino acids, nucleotides, nucleic acids and choline exchange. Cyanocobalamin (vitamin B12) is involved in nucleotide synthesis; has a vital role in normal growth and development of epithelial cells, normal haematopoiesis and erythrocyte maturation, folic acid metabolism and myelin synthesis. Following oral administration ferrous ion presented in the formula is almost completely absorbed from the gastrointestinal tract to the systemic blood. The maximum iron concentration in blood plasma is achieved 2-4 hours after administration. The iron is almost completely bound to plasma transferrins and involved in the formation of haemoglobin, myoglobin, cytochrome oxidase, catalase and peroxidase or deposited in reticuloendothelial system cells. For detailed information on the medicinal product Haemoferon, please see “Package leaflet” page. 1 This drug can be used during pregnancy only as prescribed and under a physician’s supervision if iron deficiency was diagnosed by laboratory testing, without exceeding recommended doses.